We all have something in common. Whether you grew up on the shores of Elk Lake or moved to Ottawa Street later in life, whether you chose to come home to Kewadin or have continued to make Torch Lake your family's summer retreat for decades, we all recognize the undeniably unique nature of the Elk Rapids area. 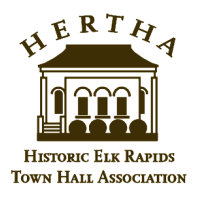 There is an ongoing need for funding to keep our newly renovated facility, HERTH Hall, in great shape, providing all of us a fabulous venue for happenings. Click here for information on a new giving opportunity - digital projection!